Statistics Denmark developed, between 2015 and 2017, a series of environmental-economic accounts – the Green National Accounts - for Denmark. This project was made possible by a corresponding three-year financing round from the Danish budget. This project has now concluded, and this page is no longer actively updated. It still contains useful information about the Green National Accounts, what they are, and what they can – and cannot – be used for. The results of the project are published in multiple places: in Statistics Denmark’s newsletters; in the Statbank, and in a comprehensive publication. These can be found on our homepage for the green national accounts. The Environmental-Economic Accounts is a general term for a system of sub-accounts for economy and environment, which are presented in association with the traditional national accounts. It complements the traditional national accounts and provides a broader and more comprehensive picture of both the economic and environmental development. It can, among other things be used to assess whether the growth in production and the environmental impact accompany each other or if we become better at producing in ways that are less polluting and conserves our natural resources. Environmental-Economic Accounts should not be confused with a 'green GDP'. The Environmental-Economic Accounts are based on internationally agreed guidelines and standards established by the UN and other international organisations. All countries are encouraged to use these guidelines. In the European Union (EU), member states are obliged to compile and report parts of the Environmental-Economic Accounts by these guidelines so that the development in the data in the countries concerned and for the EU as a whole can be followed. Read more about the international development and the opportunities to compare across borders. An international development. An international development. Statistics Denmark already publishes sub-accounts for many areas within the Environmental-Economic Accounts. This applies to energy, emissions to air, product and material flows, production of green goods and services, green taxes and environmental motivated subsidies and public environmental expenditure and revenue. As part of the ‘green national accounts’ project, new accounts for waste, water and waste water have already been published. Additional accounts for environmental protection expenditures and various Danish natural resources are to be published in 2016 and 2017. By using the same boundaries, definitions and classifications as the traditional national accounts, Environmental-Economic Accounts can highlight the relationship between the economy and the environment in a logical manner, based on the industries’ and the households’ activities. For example, it is possible to compare the industries’ production values or value added to the physical energy and water consumption used in production, and also highlight the resulting waste generation and emissions to air. Similarly, the accounts of oil and natural gas, land, fish and forest compliment the traditional national accounts calculations of capital stock in the form of buildings, machinery and equipment with information about the stocks and use of the natural capital that is a necessary condition for the functioning of the economy. Finally, the Environmental-Economic Accounts highlight parts of the traditional national accounts that are closely linked to environmental and natural resources. Activities such as environmental protection and the production of green goods and services and the use of green taxes and environmentally motivated subsidies and other environmental transfers are part of the national accounts, but in practice almost invisible as the information on these activities have been merged with "non-green" activities. 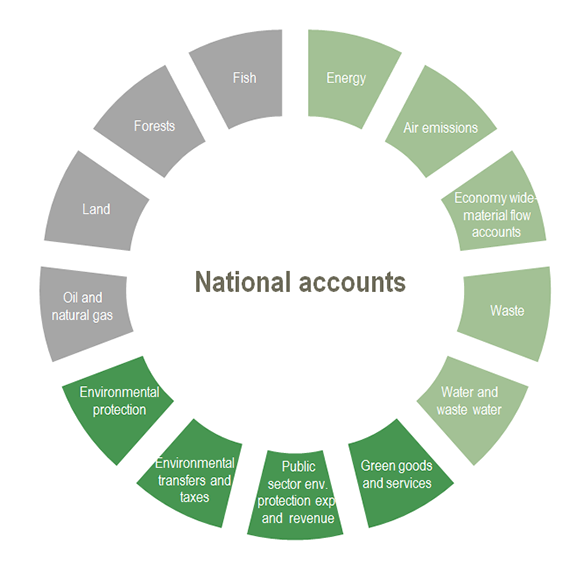 The Environmental-Economic Accounts identify and highlight these parts of the national accounts in special sub-accounts. Thus, the Environmental-Economic Accounts contribute to highlighting areas such as green economy and green growth, as well as society's efforts to protect and preserve the environment and natural resources.